Dry mouth is a common problem that affects many adults. Are you looking for a quick remedy for your dry mouth? Then look no further. 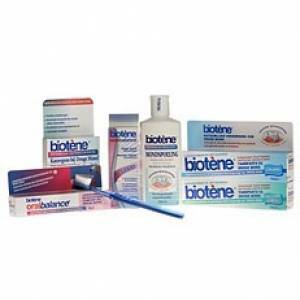 Biotene Oralbalance toothpaste and mouthwash stimulate saliva production and provide long-lasting freshness. The enzymes supplement the mouth's natural defence system. In addition, Biotene Oralbalance prevents dental plaque from forming and protects teeth from cavities. The anti-bacterial formula also offers protection from odour-causing bacteria. Having a dry mouth can be very uncomfortable. Dry mouth is a condition in which the mouth and tongue are unusually dry and painful due to lack of saliva. Since saliva is a natural lubricant, people with dry mouth may have trouble eating, swallowing or speaking. Dry mouth can be caused by lack of nutrition or an infection of the salivary glands. It is also a common side effect of many prescription and non-prescription drugs, including drugs used to treat depression (antidepressants) and hypertension (antihypertensives). Dry mouth may also be brought on by diabetes, kidney disorders, chemotherapy, stress or old age. Ordering Biotene products online is very easy. Order today and improve your dry mouth issues tomorrow.